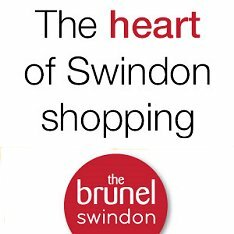 Situated in Town Gardens, off Springfield Road and Quarry road, The Bowl really is Swindon's best kept musical secret. 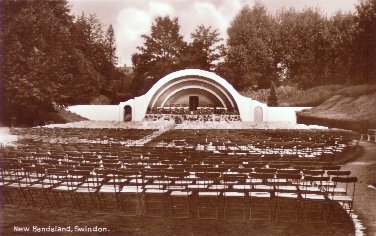 Designed by Alfred Ridout, and built in 1936 by Swindon Borough Council, The Bowl has played host to many of the town's top musical events of the last 65 years, and still exists as a completely unique venue for its excellent atmosphere and acoustics. The stage stands in an 'ampthitheatre' created by quarry workings in the eighteenth century. Nowadays, with grassed banks and mature trees surrounding the 'auditorium', it really is a wonderful setting to sit and enjoy any kind of music or event on a summer's evening. During its time, The Bowl has reverberated to the classical afternoon concerts of the 40s and 50s, right through to the swinging 60s, rock of the 70s and a major Rhythm 'n' Blues concert in front of 1800 people in 1987. And since its refurbishment in the early 1990s, the bowl has proved the ideal location for thousands of avid music fans to enjoy music from near and far. Highlights have included the Bournemouth Sinfonietta concert in 1995 and none other than the great Jazz impresario George Melly strutting his stuff in 1997. Swindon Borough Council has organised a number of hugely popular summer concerts including last year's Irish night with County Antrim's finest Willie Drennan, the Carlene Anglim Salsa and Latin night and the unforgettable New Orleans Jazz Concert. 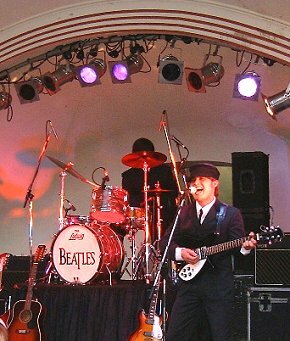 Swindon's very own highly-rated Beatles tribute band The Ludwig Beatles performed in front of a sell-out audience in July 2000. It was the perfect venue, stirring memories of the real Beatles' famous concerts at the Hollywood Bowl in 1964 and 1965. More recently the World Music concerts have again added further breadth to the bowl's varied musical history, and continue on the story of Swindon's finest piece of musical architecture. 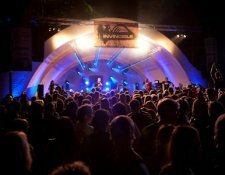 All the concerts are evening events, and everyone is welcome to bring their own picnics and drink to The Bowl, although there will be a licensed bar and hot food stalls. 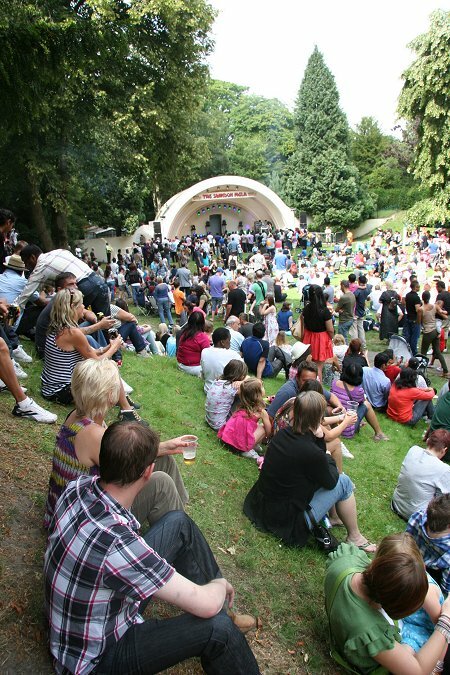 Add in yearly events like the Swindon Mela, Swindon Pride, Reggae Garden & open-air cinema and you have a venue that really is a summer favourite. Our thanks to Mr Dave Bedford and the Swindon Society for providing the photograph at the top of the page. Win Dolby phone + VIP Invincible tickets!